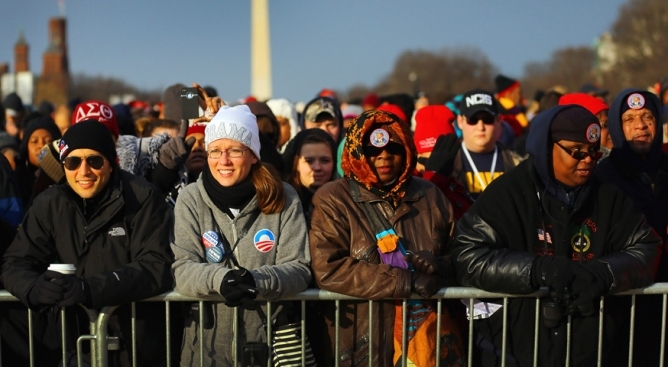 President Barack Obama will be ceremonially sworn in for his second term today, in front of a crowd of an estimated 700,000. In 2009, an estimated 1.8 million people came out to watch Barack Obama's first inauguration, this time around the crowd is expected to be a measly 700,000. Still, more than 2,000 cops from around the country will be on hand to give the DC PD a hand. The first piece of cake eaten by Obama during his second term will no doubt have been baked by former "Ace of Cakes" star Duff Goldman, and served at the Commander in Chief's Ball. Dessert will be about four feet high, weigh 50 pounds and "glitter is going to be all over the place," Fox News says. You've no doubt seen Michelle Obama's new bangs, and now it can be revealed what she, Sasha and Malia will be wearing for today's festivities. And this is your last chance to learn how to spell inaugrationinaguration "inauguration," a word that has vexed hundreds of Twitterers and reporters over the past month, ABC says.